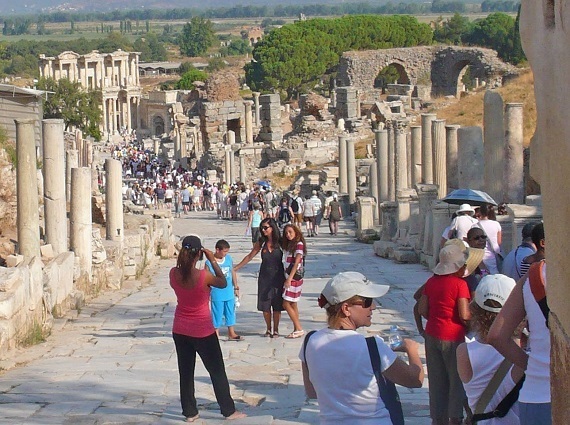 Some 2 million visitors a year, many from cruise ships, pack the lanes of Ephesus. I took a whole bunch of pictures at the old Greco-Roman city of Ephesus. Actually, I didn't know much about this spot on the Turkish coast before our cruise ship stopped at the port of Kusadasi, from which it's a half-hour bus ride to the ruins. Ephesus turned out to be a real eye-popper. Think of a travel poster showing the columned lanes, temples, shrines and theaters of an ancient Roman city. Then make the city 10 times bigger, super-size its baths, library and amphitheater, and you've got Ephesus. Historians say it was the Roman empire's second largest city, topped only by Rome itself. Rich Ephesians lived in opulent hillside villas. Founded as an Ionian colony in the 10th century B.C., the city fell to the arrows, swords, scimitars and cannons of a succession of conquerors over the years, notably those of the Greeks, Persians, Egyptians, Romans, Goths and Christians. Ephesus' end came from the double-whammy of a massive earthquake in 614 coupled with a huge buildup of silt in its harbor - so much that the shoreline edged 6 or so miles out to sea, putting the city that far inland. With the loss of the harbor, traders working the coast of Asia Minor moved elsewhere, which pretty much put Ephesus out of business. Scholars once waded through 12,000 scrolls in the library of Celsus. As I said, I took lots of pictures. I burned up the gigs snapping sights like the iconic library of Celsus, the temples of Hadrian and Domitian, the fountains of Trajan and Pollio, the Gate of Heracles, the little Odeion theater and the hillside villas of the Roman silky set. After a long day of scroll-reading, some scholars may have slipped away to the town brothel through a hidden tunnel near the library. After that, they may have visited Ephesus' answer to Beverly Hills' Rodeo Drive upscale shopping mecca on their way back home. I took some snaps from the stage of the 20-story-high outdoor theater where St. Paul made his pitch for Christianity - and got drowned out by choruses of something like "Hooray for Artemis" from the spectators (many of whom made big bucks by selling statues of the multi-breasted goddess). Later on, Paul put his thoughts on the religious issues of the day in a letter to the Ephesians, which became a book of the New Testament. 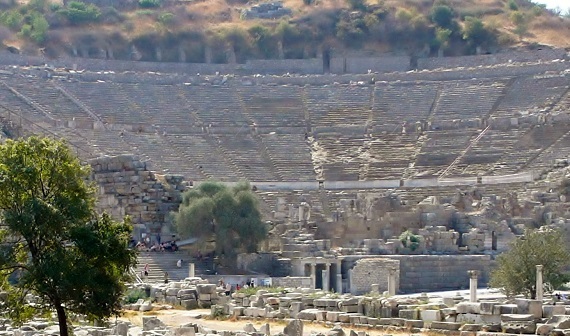 St. Paul preached to the Ephesians in a 25,000-seat theater. 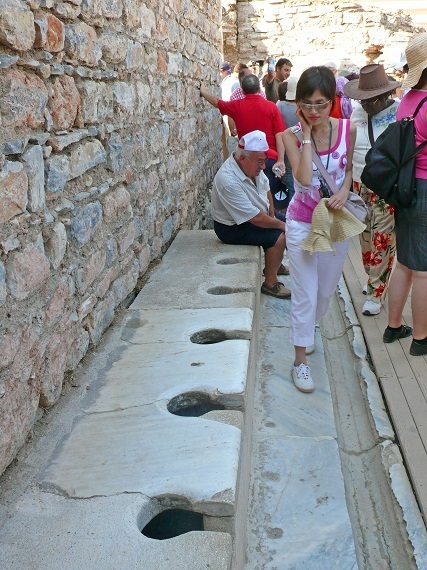 Visitors check out 3,000-year-old public potties. Out in a swampy area of the site I ran across an odd-looking marble column, patched together from pieces of smaller columns. I thought about taking a shot of it, but figured it wasn't worth the effort of a click. Big, big mistake. "I have set eyes on the wall of lofty Babylon on which is a road for chariots, and the statue of Zeus by the Alpheus, and the hanging gardens, and the Colossus of the Sun, and the huge labour of the high pyramids, and the vast tomb of Mausolus; but when I saw the house of Artemis that mounted to the clouds, those other marvels lost their brilliancy, and I said, 'Lo, apart from Olympus, the Sun never looked on aught so grand.'" So who was Artemis? Her story goes back to 3,000 B.C., when the big buzz on Mt. Olympus was that Zeus, the Greek god of gods, was about to become a proud daddy, thanks to his girlfriend Leto. The dad-to-be's delight, however, wasn't shared by Mrs. Zeus - who let it be known that anyone who allowed the shady lady to give birth on his turf would be turned into a frog. White stone lions guard the sacred walkways of Delos. Ranking in the top tier of the Greek pantheon, Artemis was the goddess of the hunt (equivalent to the Roman goddess Diana), wild animals, childbirth and the protector of young girls, among other tags. Her main temple at Ephesus was said to be roughly the size of a soccer field soaring six stories high and surrounded by well over 100 columns. Originally built around 800 B.C., the temple was destroyed and rebuilt and enlarged several times until the Goths finally did it in around 268 A.D. True, I had nothing to show that I'd been standing on the site of this wonder of wonders. 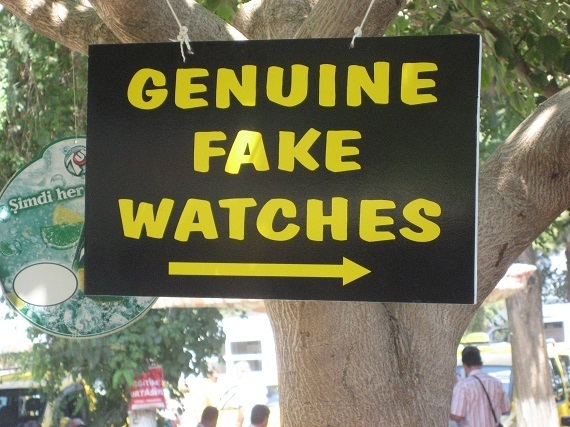 But I did come back with a shot of a sign worth a few chuckles every time I show it. I took it just outside the ruins' rear exit over a row of stalls full of products you'd hardly expect to see next to the ancient treasures of Ephesus.